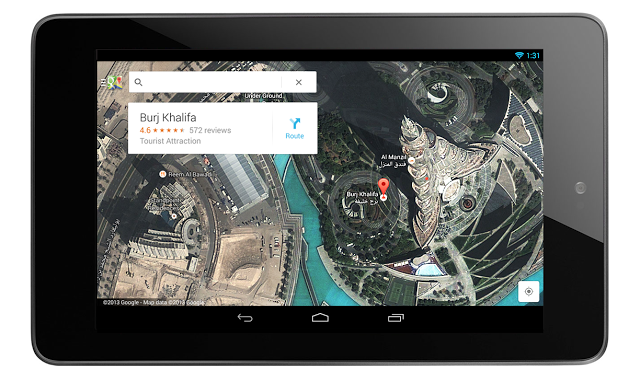 Official blog of Google announced the major update to Google Maps yesterday, first showcased at Google I/O 2013 in May. The promo video demonstrates the changes, shows off some new features and is said to soon become available for iOS 6+ devices as well! What draws the attention most, among several new features, is the enhanced navigation with real-time incident reports and better route alerts, once they’re available. The improvements included in the update also include a revamped appearance across platforms, enhancements to reviews, Zagat and Offers, along with the new Explore feature where you get cards showing places to eat, drink, sleep and shop just by tapping the search box. Latitude and check-ins are removed for the app, with Google saying said it will be retiring these from older versions on August 9. However, location sharing and check-ins to Google+ are coming soon to iOS. Google explains that “people who want to create powerful custom maps can still do so with Maps Engine Lite on desktop.” So their updated app will be available soon in the App Store, the search giant promises. Check the video of the augmented Google Maps and do not hesitate to share your impressions in the comments below.